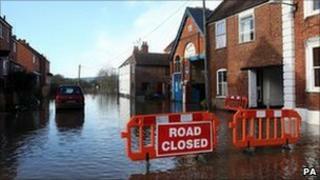 Flood protection grants worth £1.85m have been allocated to councils in the West Midlands region. The money is designed to help local authorities comply with their new responsibilities set out in the Flood and Water Management Act 2010. Grants were allocated according to the risk each authority faced, the Environment Secretary said. Staffordshire Council received the most, £164,000, while Telford & Wrekin Council was given the least, £117,000. The money could be used to produce flood maps, draw up risk management plans and to promote flood awareness, Environment Secretary Caroline Spelman said. Funding for 2011/12 would total £21m rising to £36m a year between 2012 and 2016. A breakdown of the figures has been published by the Department for Environment, Food and Rural Affairs. Ms Spelman, the Conservative MP for Meriden, said: "This money will go a long way to help local flood authorities identify and deal with the risk of flooding in their own communities. "Each local authority can decide where the money will be of most use."